Steve Buscemi is not really into the viral Deepfake video of his face pasted on Jennifer Lawrence's. The actor is currently out promoting his new show on TBS titled Miracle Workers, where he plays a burnt-out version of God who is ready to end the world. Buscemi appears alongside Harry Potter star Daniel Radcliffe and Deadpool star Karan Soni. In a new interview, Buscemi discusses the new show along with the Jennifer Lawrence video and his work with the Beastie Boys. Stephen Colbert presented Steve Buscemi with the viral video of his face swapped with Jennifer Lawrence while she's being interviewed at the Golden Globes. The actor had heard about the video before, but he had never seen it, and he does not like what he sees. 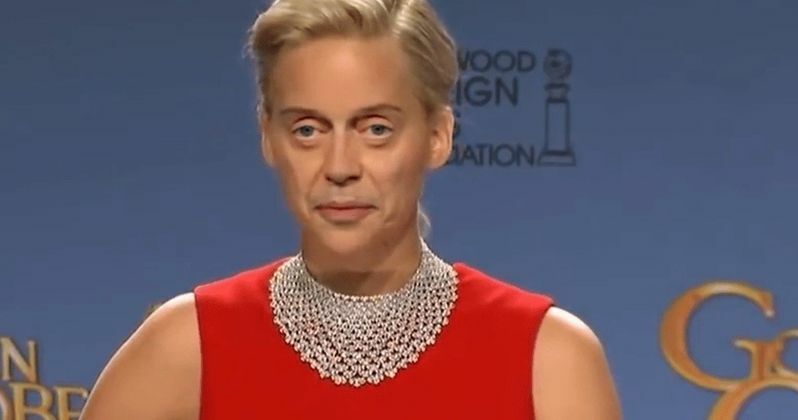 However, after the video concluded, Buscemi did note that he's "never looked better." The video is pretty disturbing to see, which is exactly why it's gone viral. You can check out Buscemi's reaction in the video below. In addition to appearing in viral Deepfake videos and starring in Miracle Workers, Steve Buscemi has worked with the Beastie Boys a few times over the years. Most recently, he offered up his voice to record a chapter for their audiobook, which includes a ton of others in the entertainment community including, Tim Meadows, Bette Midler, Bobby Cannavale, Mix Master Mike, Exene Cervenka, Nas, Jarvis Cocker, Rosie Perez, Elvis Costello, Amy Poehler, Chuck D, John C. Reilly, Snoop Dogg, and Will Ferrell, just to name a few. As it turns out, Buscemi is friends with Beastie Boys member Michael Diamond's godmother. However, when it came to getting a guest-starring slot in the Beastie Boys video for Fight For Your Right Revisited in 2011, Buscemi was not originally asked to participate. His friend and fellow actor, Stanley Tucci, told Buscemi about the massive cast and how much fun it was going to be, so he asked Tucci to pass the word along that he was in town and that he would love to come by. Buscemi states that it is the only time in his life that he has ever asked for a role, which is pretty funny to think about since he's been in so many iconic movies and TV shows. Steve Buscemi has appeared in Reservoir Dogs, Pulp Fiction, The Big Lebowski, Boardwalk Empire, and too many other huge projects to count, but one of his favorite roles was getting to play a waiter in a Beastie Boys music video/short film. On the other hand, it seems like one of the actor's least favorite roles is as Jennifer Lawrence being interviewed. You can check out Buscemi getting uncomfortable watching the Deep Fake video below, thanks to the Late Show with Stephen Colbert YouTube channel. The Deep Fake part takes place at about the 5:30 mark.